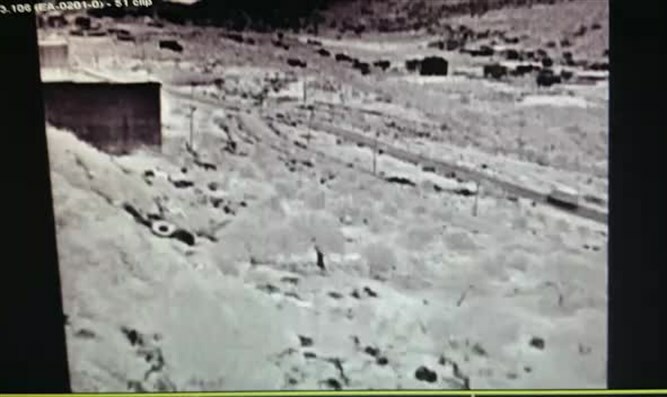 Security forces chase off infiltrators attempting to break into Samaria town. Last Friday night, security guards in the town of Rehelim in Samaria identified two suspicious figures approaching the town. Rehelim's military security coordinator arrived first, fired a light bomb, and noticed the two suspects running away. "We finished praying and went down to the house," Amichai Muati, a member of the alert squad, told Arutz Sheva. "I still managed to get ready for Kiddush and around 7:00 PM we received a report about two suspicious figures coming up towards Rehelim. He asked me what was happening, I explained the matter to him and he was a friend of mine, and we were asked to perform searches in a certain area that feared that the infiltration was possible, we thought there might be someone else who did not see him on the camera." "We have to catch the cell and destroy it," said Muati, "It must have come from the hostile village of a contractor, where there was an arrest of armed terrorists, a very violent arrest. We do not want anyone to die and then put more security measures." "With the Henkin family, a month earlier, the cell that murdered them tried to carry out another attack and could not stop them, and I assume that if they had been arrested then the Henkin's murder would have been avoided," Muati said. Ayelet Lasch, a resident of Rehelim and a right-wing social networking activist, told Ynet about how the residents felt following the incident. "I think that a disaster has been prevented." "Terrorists who come from the village here to try to enter a Jewish settlement at night apparently know that nothing will happen to them. It is a loss of deterrence and that is really sad. "We expect more assertiveness and more aggression against the enemy, and now it is a miracle, but it could have ended much worse."